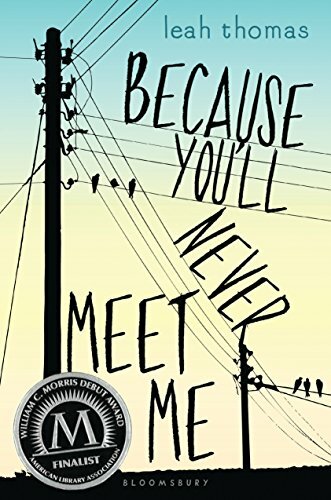 Because You’ll Never Meet Me by Leah Thomas. This one was pretty fascinating. Oliver is a teenage boy who lives with his mom in a cabin in the middle of nowhere. So in the middle of nowhere that the cabin doesn’t have electricity. It can’t have electricity because Oliver is allergic to it. As a newborn he had massive seizures in the hospital and they figure out he was allergic to electricity once they took him completely away from it and he stopped seizing. As a result he can’t have a normal life. He can’t go to school. He can’t even walk to the end of the driveway because of the power lines that are strung over it above. He becomes a pen pal with Moritz in Germany. Moritz was born without eyes, so he develops a hyper sense of echo location. He’s able to go to school and can “see” by his echo location. But the problem is Moritz is bullied at school, and he has to cope with his simultaneous ability and disability. But isn’t it random that the boys write to each other. How would a boy living out in the woods know to write another boy in Germany? It’s because they are connected from birth and we get to figure out why. 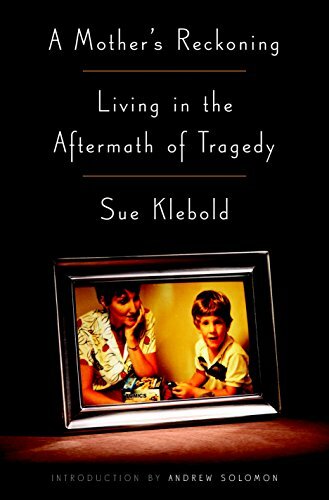 A Mother’s Reckoning by Sue Klebold. Does the name Klebold sound familiar? Think back 20 years ago to Littleton, Colorado. There was a boy named Dylan Klebold who, with his best friend Eric Harris, brought an arsenal of weapons and bombs and shot up the school. They killed 13 classmates and teachers before turning the guns on themselves. Sue is his mother. And in her memoir she discusses her experience as the mother of a mass murderer. When the tragedy happened we were all like “And where the hell were his parents?” Well, Sue tells us where she was. She was in their home raising their son and doing her best. Sue Klebold got me to think of what Dylan did in a different light. In the end he committed suicide. She copes by thinking of him as a suicide victim and not a mass murderer. And it’s true. She lost her son to suicide. But the problem was he took a bunch of people with him. This is the story of a mother who questions what she did wrong. She blames herself. And this book details her quest to find out why. The Gatekeepers by Jen Lancaster What is it with the suicide books right now? This is not your typical Jen Lancaster book. She’s normally the author of funny memoirs and light fiction. But this one hit me like a ton of bricks. Her town, Lake Forest, Illinois, has seen a spate of teen suicides lately. 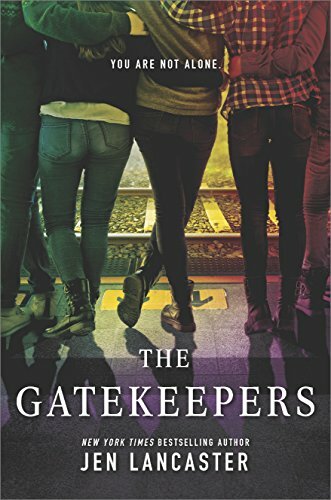 In The Gatekeepers she fictionalizes the town and follows the story of teens who are driven to excel and succeed to the point where their self worth is entirely dependent on their grades, winning and their parents’ hard won approval. In the book the teens are exploring why a few of their classmates have opted to jump in front of the commuter train that whizzes through their town.